The nutrition graduate program within the Department of Dairy Science is an internationally renowned group with research addressing questions spanning from applied to basic. The nutrition group is comprised of Drs. Armentano, Combs, Shaver, Wattiaux, and White. 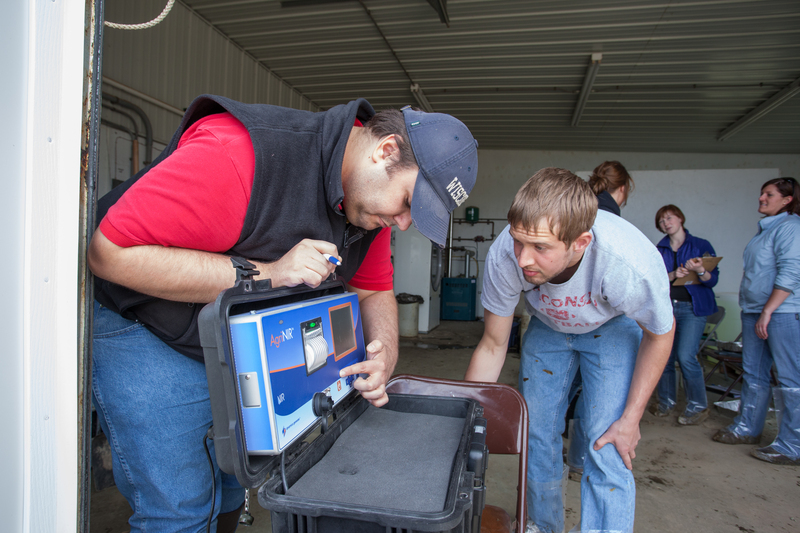 Students pursuing a MS or PhD in Dairy Science with emphasis in nutrition work in a shared laboratory space that fosters a collaborative training environment with other graduate students, post-doctoral research associates, and faculty. Research focus varies by faculty within the nutrition group and include forage quality and processing, starch utilization, fiber digestion, NDF analysis and modeling, lipid metabolism, milk fat depression, dietary nitrogen use efficiency, protein metabolism, amino acid balancing, byproducts and additives, methane emission and the linkages between nutrition and environmental impacts, hepatic metabolism, and metabolic disorders. Research within the nutrition group is highly collaborative and integral and involves collaboration with other disciplines within the Department of Dairy Science, researchers in other departments at the University of Wisconsin focusing on aspects of dairy production (Agricultural Engineering, Food Science, etc. ), as well as other research groups worldwide. Opportunities for joint graduate training programs through the Department of Dairy Science and the US Dairy Forage Research Center (USDFRC), University of Wisconsin School of Veterinary Medicine, and the Interdepartmental Graduate Program in Nutritional Sciences (IGPNS) are available. Graduates at the MS level typically pursue employment in industry with positions including field nutritionists, technical support, and laboratory technicians and graduates at the PhD level pursue research-based positions in academic institutions, government laboratories, or private industry.